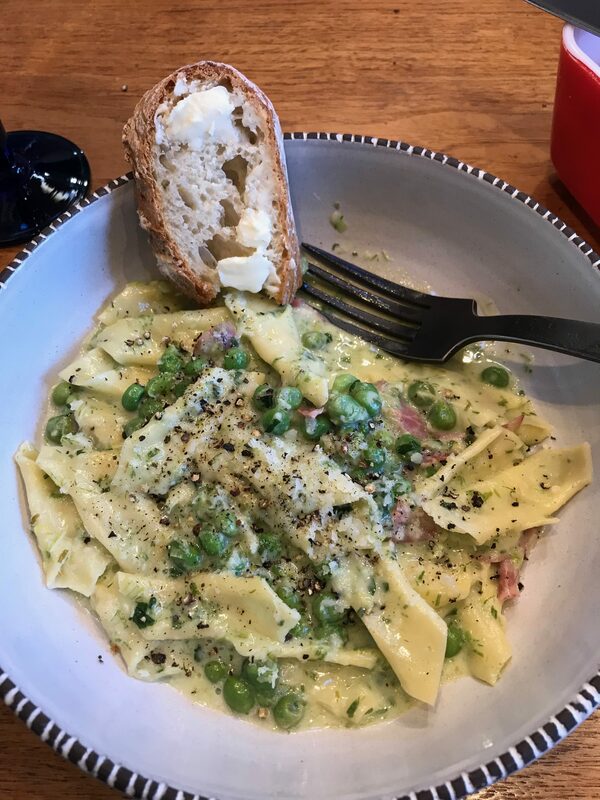 Taste of Spring Pasta with Scallion Cream, Peas and Capicola – Damn Life is Good! Hello Spring … oh, how we have missed you! This pasta dish just screams SPRING! SPRING! SPRING! Although this dish contains cream, it is surprising light and the mint and lemon give it just the right amount of freshness and pop. Paul made fresh pasta because that’s his thing, but a decent store bought pasta would do. Smash 3 garlic cloves. Place chopped scallions, creams and garlic in sauce pan. Finely chop remaining 3 cloves to equal 3 T. Set aside. Bring mixture to bowl over medium-low heat. Reduce to low, stirring occasionally , until scallions are crisp tender and garlic is softened, about 10 minutes. Pour mixture into blender and process until smooth. Stir in salt and set aside. Melt 2 T butter in large skillet on medium heat. Add 1 T reserved chopped garlic, cook until softened and fragrant, about 2 minutes. 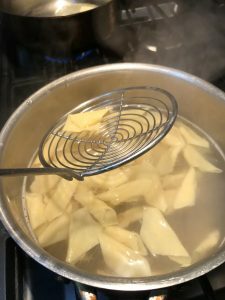 Using a large spoon, transfer pasta to skillet reserving cooking liquid. Add cream mixture and peas then increase heat to med-high. Cook and stir constantly until pasta is tender and sauce is loose and creamy, about 2 minutes. Remove from heat. Add capicola, cheese, mint, lemon zest and juice, remaining 2 T butter and 1/4 C cooking liquid until combined.